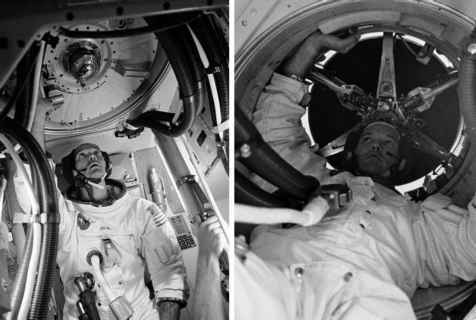 Getting off the Moon and back to the relative safety of the command module was a feat that literally defined the mission. NASA even named the entire mission plan lunar orbit rendezvous (LOR) in view of the important benefits the technique promised in overall weight savings, including the launch vehicle. Yet, to many in NASA in the early 1960s, it seemed suicidal for one tiny spacecraft to launch and attempt to pull up alongside another tiny spacecraft, each whizzing along at over 5,000 kilometres per hour around another world nearly half a million kilometres away. At that time, no one had even attempted rendezvous in the relative safety of Earth orbit in spacecraft that could at least return to the ground if things went awry. It was a measure of the managers' faith in their engineers and scientists that they felt confident to march ahead with an apparently hare-brained scheme which, if it were to go wrong, would doom two men to certain death in lunar orbit. • Could the manoeuvrable Gemini spacecraft station-keep with its spent upper rocket stage? • Could two independently launched spacecraft rendezvous and station-keep? • Could a spacecraft rendezvous and then dock with an unmanned target? • Could it achieve the same feat within a single orbit? It will help the reader to understand the concepts behind rendezvous if a short diversion is taken into the field of orbital mechanics. At first glance, this topic seems arcane and, if studied rigorously, it is. It also appears counter-intuitive but the basic concepts behind the subject are easy enough to grasp, and are really an extension of the orbital lessons discussed in Chapter 4. To lay down the groundwork for this we need to establish some basic ideas. Unless some kind of propulsion is being used, all movement in space is governed by the gravitational attraction of the bodies (suns, planets, moons, asteroids, etc.) among which things move. In general, the gravity of the nearest large body dominates, so for the purposes of this explanation we shall ignore the pull from other bodies. 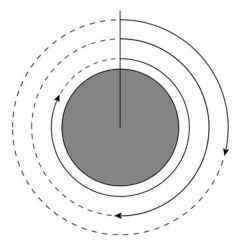 Any spacecraft in orbit moves around the central body in an ellipse. Even a perfectly circular orbit is treated as a special form of ellipse whose eccentricity value is zero. There are three principles to keep in mind with orbital motion. First, a spacecraft in a higher orbit takes longer to go around than one in a lower orbit. At first glance, this appears obvious because there is a longer circumference to travel, but that is only part of the story. The more important point to grasp is that it really is a slower orbit. The spacecraft is moving at a slower linear speed because the pull of gravity from the central body becomes weaker with distance, and a lower speed can maintain the perpetual fall that is an orbit. As an illustration, the Saturn V inserted the Apollo spacecraft into a low orbit only 170 kilometres above Earth, which took only an hour and a half to go around. Its linear speed was 7.8 kilometres per second. Geostationary satellites - the mainstay of global communications and television satellite broadcasting - orbit 35,800 kilometres above Earth's equator. They take about 24 hours to get around once, and travel at only 3.1 kilometres per second. Diagram of variation of orbital period with altitude. Diagram of basic rendezvous technique. back into the original orbit, which we shall deal with later. The reverse is also true. If the pursuer is ahead in the orbit, it can 'slow down' by accelerating forward, which causes it to rise to a higher and therefore slower orbit, then dropping down again when the target has caught up. The concept of changing from one orbit to another is a topic we have already met in Chapter 4 because Apollo's TLI burn took it from a circular orbit to a highly extended elliptical orbit which happened to intercept the Moon. Changing orbits is a common requirement in spaceflight and is embodied by our second principle. The most efficient and simplest way to change an orbit is to use a Hohmann transfer technique, whereby firing a spacecraft's engine along the direction of motion at one point in the orbit will increase its speed and thereby raise the altitude that will be reached on the opposite side of the orbit. Firing against orbital motion will slow the spacecraft and lower the altitude of the opposite side of the orbit. Controlling the total impulse from the burn controls the altitude that will be reached. We have met this already in the way the CSM and LM made burns around the Moon's far side to raise and lower their near-side altitude. To move from a lower circular orbit to a higher one, a burn would be made in the direction of motion until it is calculated that the point in the orbit opposite the spacecraft, now the apogee, is at the height of the intended circular orbit. Once the spacecraft has coasted around in its orbit to its apogee, another burn would be made along the direction of motion to raise the perigee until it equals the apogee's altitude. necessarily have an orbital inclination of at least 28 degrees; this being the latitude of that site. The most efficient way to get a spacecraft from one orbital plane to another is to make a burn at the point in the orbit where the two planes intersect, known as a node. Unfortunately, the physics of the situation dictate that any but the smallest of plane changes will be very expensive in propellant. Moving a communications satellite from a 28-degree low Earth orbit to its geostationary outpost uses almost as much energy as would be required to send it to the Moon! For Apollo, minimising plane change manoeuvres was vital, especially for the LM's ascent stage where propellant margins were very tight.